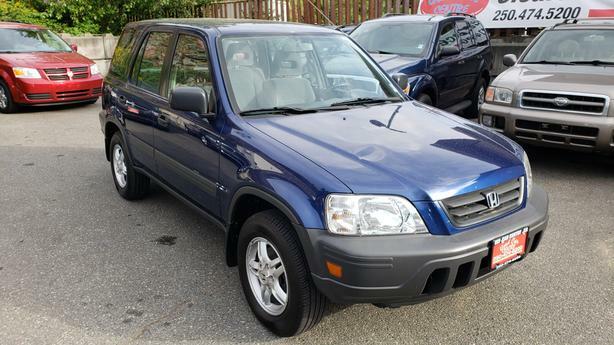 1997 Honda CR-V 4WD SUV. Blue with grey cloth interior. Automatic. 2.0L 4 Cylinder Engine. U.S vehicle with 158211 miles, timing belt done at 150 000 miles, one owner vehicle with no accidents, Power windows, locks, and mirrors. Cruise control. A/C. AM./FM/CD stereo. Excellent condition in and out, Nicest one you will find! Green Light Financing now available! When others say no, we say yes! No pay stubs required and we have lending options no other dealership can provide! Conditions may apply to certain vehicles and may require money down, but nobody works harder to get you driving than us! Call the sales team today at 250-474-5200 to arrange a test drive or email for more information. We takes trades as well! We are open 7 days a week!